*Indicative price: this price is just an indication of a possible resale price of your wholesaler, included for indicative reference purposes only. Your actual purchase price is subject to the agreement between you and your wholesaler, and could thus be lower or higher. Great stock adds depth of flavour to your dish. Here’s an ingredient made with real chicken that adds flavour and not saltiness to the dish. Maltodextrin (sulphur dioxide), salt, flavourings (HVP, celery), hydrogenated vegetable fat (palm fruit)(contains antioxidant TBHQ), chicken (3%), potassium chloride,vegetable powders (onion, garlic), flavour enhancers (E631, E627), radurised thyme, radurised turmeric. Cereals cont. Gluten + prods. Poultry Meat, Fat & Prod. Dissolve 100 g stock granules in 5 litres of water (warm to boiling). Makes 5 litres of stock. 1 kg makes 50 litres of stock. 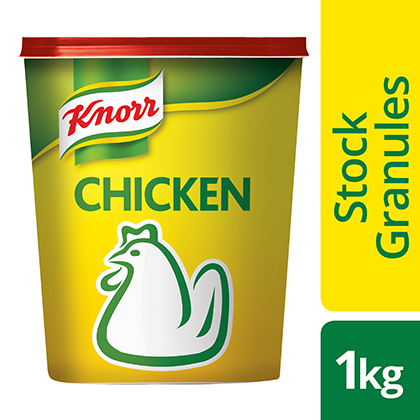 Knorr Chicken Stock Granules add a rich chicken flavour to soups, stews, sauces, gravies, casseroles and pies. Sprinkle on roasts, grills, savoury omlettes and snacks for extra flavour.